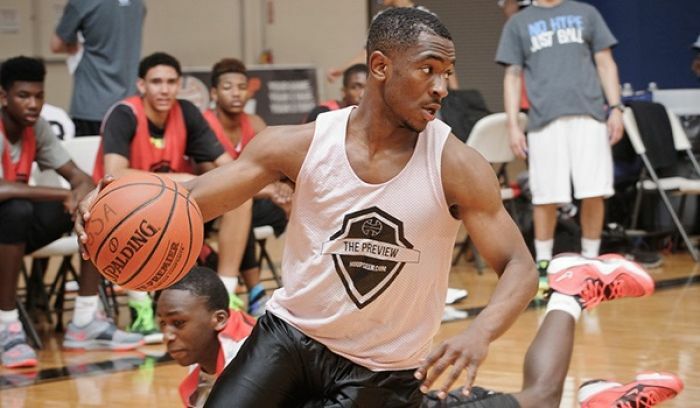 Aaron Augustin a 5’11 PG from Suwanee, GA. will reportedly visit ETSU on Thursday according to Hoopseen. According to the Hoopseen article, Augustin took an unofficial visit to Tennessee Tech on August 21st but ETSU will be his first official visit. Augustin, a 2016 recruit, emerged this summer on the AAU scene and has garnered multiple mid-major offers, two of which come from SOCON rivals UTC & Mercer. The 5’11” PG from Duluth, GA is said to be a heady, pass-first PG who knows how to run the row. His court vision is excellent and he is superb when finding teammates in transition. He also is a good shooter from the outside and knows when to take it upon himself to score the basketball. Augustin is everything that you would want out of a point guard. He is skilled and balances creating for himself and for others at the right amount. He changes directions and speeds with the ball that allow him to create space at proper times. He showed a terrific pull-up jumper on the break from beyond the arc, while he also got into the lane and finished around bigger players. He shows a willingness to defend and defend with energy. He was vocal on the floor, which got his team into their proper spots. Although listed at 6 feet tall, I question if he actually closer to 5-10. Ultimately his ability to get the most out of his physical abilities will tell how productive he will be at the next level.